The AmeriCorps Health Fellows is CCALAC’s Workforce Pipeline program focused specifically on increasing access to comprehensive primary care for Los Angeles County’s medically underserved. In partnership with California Volunteers and the Corporation for National and Community Service (CNCS) the CCALAC AmeriCorps Health Fellows program places AmeriCorps Health Fellows at various community health centers across Los Angeles County. Selected AmeriCorps Health Fellows are placed at one of CCALAC’s Member clinics and serve full-time for 11 months. They work in a variety of roles including: outreach, enrollment and health education. In exchange, AmeriCorps Health Fellows receive a modest $16,500 living allowance (disbursed in bi-weekly installments), health insurance, student loan forbearance, mileage reimbursement, training, a $6,095 education award, valuable work experience, and gratifications knowing you have helped make a difference in the lives of the medically underserved. The CCALAC AmeriCorps Health Fellows program is ideal for recent college graduates interested in pursuing a career in community/public health or those wanting to work and learn about community health centers, the populations they serve, and their operations and functions. 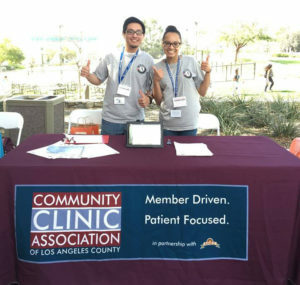 Many of CCALAC’s past AmeriCorps members have gone on to successfully be admitted to medical school, MPH programs or have been hired by their host site clinic! To learn more about Americorps, please visit the AmeriCorps website. Please review the AmeriCorps Health Fellows FAQs before submitting your application. Administered by CaliforniaVolunteers and sponsored by the Corporation for National and Community Service.